(1 hour) – Karen will take you on a journey through her growth as a quilter. You will see how the journey started with her first quilt to her most recent work. These three circular designs are Folk Art inspired. In class we will focus on Block One (left side). During class you will learn to make perfect circles, smooth edges and sharp points. Come have a fun time learning Karen’s favorite hand applique techniques. The finished size is 14” x 44”. To see more images click on "Gallery". No Longer Available. Class listed remains here for contracted guilds to have access to supply list. While sewing on this 10" square block you will learn to sew smooth curves, sharp points and perfect circles. I will make your hand applique experience fun, easy and enjoyable. This supply list is for the three hour workshop only. Additional supplies are needed for the six hour workshop and are listed below. The full Fiesta Mexico pattern is included with the "pattern plus" fee. If you do not already have a copy please wait until class to purchase. Students receive the pattern at a deep discount. This little wall quilt is fun and easy to make. While you hand applique you will learn to make nice smooth curves, sharp points and perfect circles. You will also learn to make smooth, even stems. Come sit and relax while Karen share's her tips for both hand and machine applique. Karen will discuss the items she uses to make it easy to achieve good results. She will also share some of her organizational tips. All you need to bring is a some note taking items...paper and pencil. (6 hours) – Folk Art is an American tradition and this design reminds me of times gone by. The simple, elegant and flowing shapes create a wonderful quilt to hang on the wall or give to a loved one. I just love seeing beautiful blooming flowers in the spring and summer. At least that is the only time I see them blooming in my area. But, now you can see them year-round with this fun to make 11" x 23" wall quilt. You will be thrilled with your smooth curves, sharp points and perfect circles as you begin to applique on this wonderful little project. And, for some added fun, we will do a little reverse applique. I am so excited about this project. Yes, there are a lot of pieces and yes, it’s going to take you a while to sew all of the pieces. But, while sewing you will learn a lot. You will learn how to make perfect points, perfect circles, perfect ovals, smooth curves, smooth stems, some hand embroidery and just for added fun.....a little reverse appliqué. This little wall quilt is fun and easy to make. While you hand appliqué you will learn to make nice smooth curves, sharp points and perfect circles. You will also learn to make smooth, even stems. We will do a little reverse appliqué on the butterfly for some added fun. The finished size is approximately 20” x 26”. These three circular designs are Folk Art inspired. In class we will focus on Block Two (center block). During class you will learn to make perfect circles, smooth edges and sharp points. Come have a fun time learning Karen’s favorite hand applique techniques. No Longer Available. Class listing remains here for contracted guilds to have access to supply list. This workshop is similar to the three hour workshop for Block Three of Fiesta Mexico but includes techniques for creating a wonderful border. 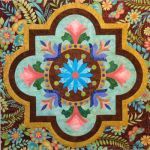 In addition to learning to sew smooth curves, sharp points and perfect circles, you will learn to create and applique perfect 1/4" strips and perfect circles of differing sizes for an exciting border. This is a really fun machine appliquéd wall quilt. You will learn to make sharp points, smooth curves, perfect circles, straight and even stems and there is a little reverse appliqué for some added fun. The technique I teach is a prepared edge method using an invisible stitch. Come join me for a fun day of machine appliqué. This is a charming machine appliqued wall quilt measuring 20" x 30" You will learn to make sharp points, smooth curves, perfect circles and nice stems. There is as little reverse applique for some added fun. The techinqiue I teach is a prepared edge method using an invisible stitch. Come join me for a fun day of machine applique. During this class we will focus on the pink vine block on the left and the bug above it. This wall quilt would make a great two or more day workshop. Find more information about this workshop and to print the supply list go to the 6 Hour Hand Applique section. Karen will share all of her tricks for sewing this 25" square block using her machine applique techniques. If the lecture or workshop requires an overnight stay, meals and lodging will need to be provided. In addition to the class fee, if driving is required, the standard mileage fee will be charged. If airfare is involved, you will be responsible for the full fee and transportation to and from the airport and airport parking. If you are located more than 1 ½ hours from my home and are interested in a lecture, the lecture must be combined with a workshop.